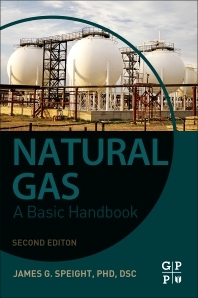 Natural Gas: A Basic Handbook, Second Edition provides the reader with a quick and accessible introduction to a fuel source/industry that is transforming the energy sector. Written at an introductory level, but still appropriate for engineers and other technical readers, this book provides an overview of natural gas as a fuel source, including its origins, properties and composition. Discussions include the production of natural gas from traditional and unconventional sources, the downstream aspects of the natural gas industry. including processing, storage, and transportation, and environmental issues and emission controls strategies. This book presents an ideal resource on the topic for engineers new to natural gas, for advisors and consultants in the natural gas industry, and for technical readers interested in learning more about this clean burning fuel source and how it is shaping the energy industry. James G. Speight is a senior fuel consultant as well as an Adjunct Professor of Chemical and Fuels Engineering at the University of Utah, USA. He is recognized internationally as an expert in the characterization, properties, and processing of conventional and synthetic fuels and as a chemist with more than 35 years of experience in thermal/process chemistry, thermodynamics, refining of petroleum, heavy oil, and tar sand bitumen, and physics of crude with emphasis on distillation, visbreaking, coking units, and oil-rock or oil catalyst interactions. Speight is currently Editor-in-Chief for the Journal of Petroleum Science and Technology, Energy Sources-Part A: Recovery, Utilization, and Environmental Effects, and Energy Sources-Part B: Economics, Planning, and Policy. He is also the author/editor/compiler of more than 25 books and bibliographies related to fossil fuel processing and environmental issues. Speight was Chief Scientific Officer and then Chief Executive Officer of the Western Research Institute, Laramie, WY, USA, from 1984 to 2000. During this period he led a staff of more that 150 scientists, engineers, and technicians in developing new technology for gas processing, petroleum, shale oil, tar sand bitumen, and asphalt. Speight has considerable expertise in evaluating new technologies for patentability and commercial application. As a result of his work, he was awarded the Diploma of Honor, National Petroleum Engineering Society, for outstanding contributions to the petroleum industry in 1995 and the Gold Medal of Russian Academy of Sciences (Natural) for outstanding work in the area of petroleum science in 1996. He has also received the Specialist Invitation Program Speakers Award from NEDO (New Energy Development Organization, Government of Japan) in 1987 and again in 1996 for his contributions to coal research. In 2001, he was also awarded the Einstein Medal of the Russian Academy of Sciences (Natural) in recognition of outstanding contributions.